Comments: Used - Acceptable Reprint Some pages are water stained. Used books do not include online codes or other supplements unless noted. Choose EXPEDITED shipping for faster delivery! "...Erik Larson...wants to tell the whole story, both the glory of Burnham's creation and the sordid details of the first known urban psychopath in American history. It is not a comfortable fit. He uses language well, but has little sense of pacing or focus, perhaps because of the huge amount of material available on the fair....There is much less material available on H. H. Holmes, and Larson tells that part of the story economically. 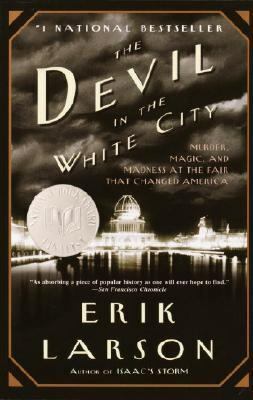 "Larson, Erik is the author of 'Devil in the White City Murder, Magic, and Madness at the Fair That Changed America', published 2004 under ISBN 9780375725609 and ISBN 0375725601.